When evaluating what’s working well in your business and what’s not, one of the aspects I like to view it is what Types of customers are most profitable for me. If I can narrow down the types of customers that are profitable, I can streamline my workflow, simplify my marketing, become known in those industries and increase my bottom line. Some businesses actually use Classes to look at the different types of customers they have. An example might be Commercial versus Residential or Nonprofit versus Business. In my business, I prefer more detail about my clientele; I want to know what industry they represent. 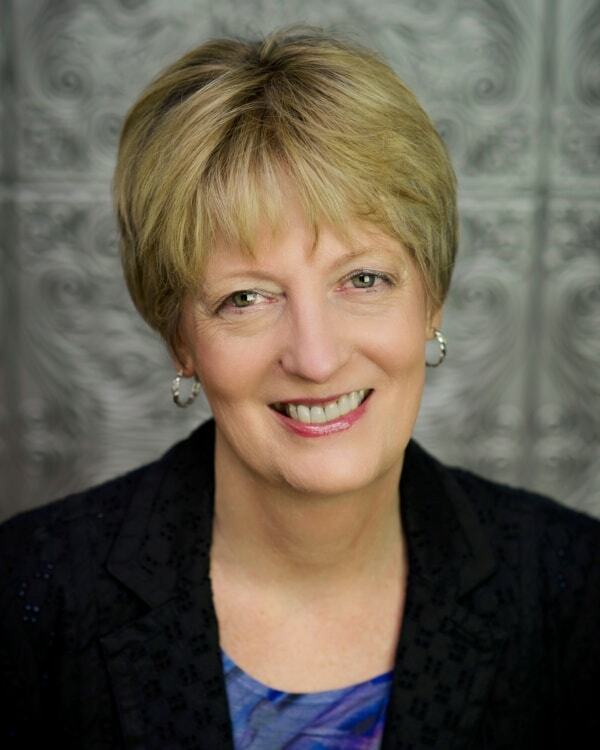 Since I find numerous classes cumbersome to review, I use the Customer Type field in QuickBooks® to describe my clients’ industries (the QuickBooks default is how clients find you) and a Custom Field for Source of Lead. You can assign only 1 type to the customer, but you can assign a different type if you have multiple jobs for a customer. Other examples of Customer Types could be type of residence (condo, townhome, single family home, estate) location (city, county, subdivision) type of manufacturer (biotech, pesticides, cold cut meats), type of business (defense agency, non-profit, medical facility) or size of business. Think about what helps you identify your ideal client and that may give you ideas. While you can get reports to show you Sales by Customer Type, that’s not always the total picture. You may find that, in some cases where the revenue is high, so are the costs. Having the ability to look at the profitability of a type of customer is helpful. 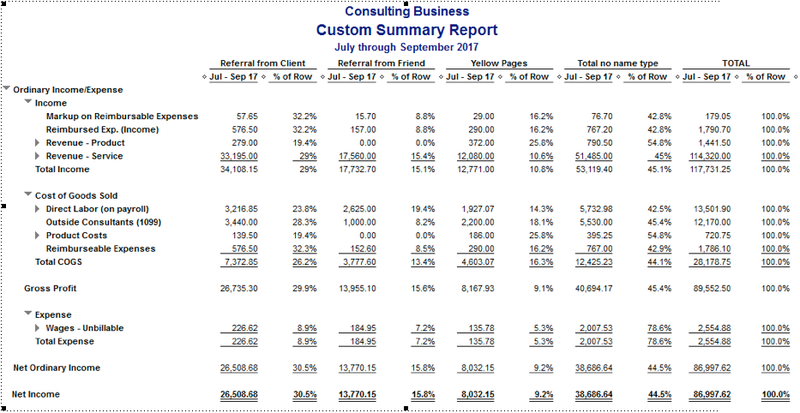 If you look at the standard P&L reports, you will not see the ability to do a Profit and Loss by customer type. However, if you go through the custom reporting, you can create a report that will let you see Profitability of Customer Type in the same format as your P & L.
1. Click on Reports> Custom Reports> Summary. 2. On the Display Tab, select your date range and Report Basis (cash or accrual). 3. In the Column section, select Customer Type from the drop- down menu. 4. Leave Display Rows by Income Statement as is. 5. 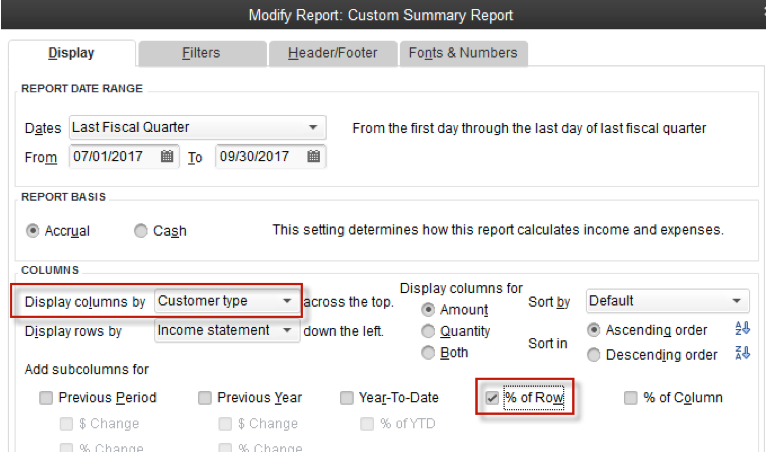 You might also want to see Percent of Row; this will let you compare different Types not only by dollar amount by the percent of your business. If you have lots of customer Types and sub-Types as I do, you might find this report will be easier to view and examine if you export to Excel. 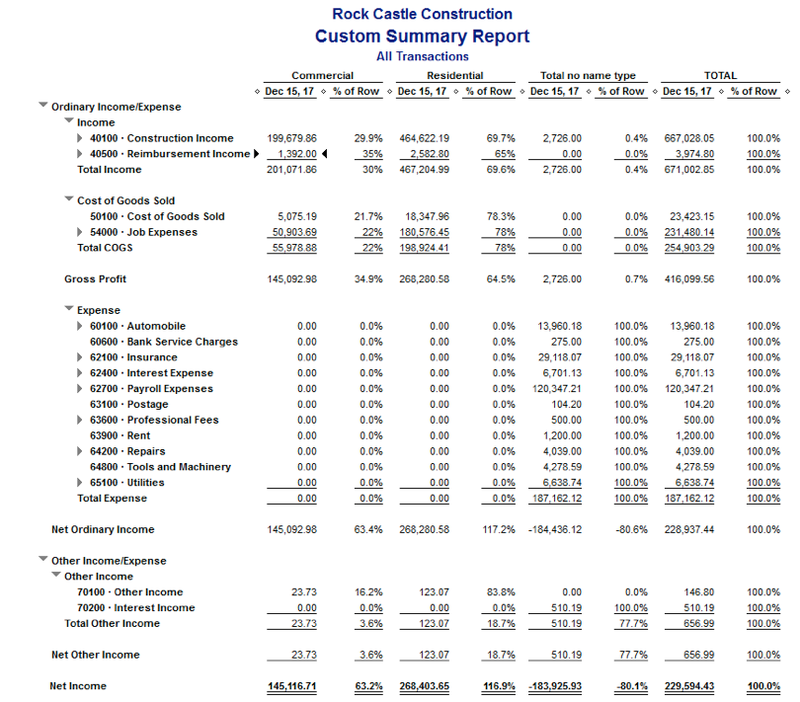 I did not see a sample QuickBooks file that really uses this field in the way I like, but here are several reports so you can at least see the format and get ideas. This report does not show all the expenses in your business; just the ones charged against a customer. Still, this can still be very helpful, especially if you have lots of costs associated with certain types of customers. This report can provide interesting insight into your business. After all, it’s not just the total dollar that these various types of customers bring into your business but the overall profitability of the different types. Isn’t that what it’s really all about?